So, what reading did I do on my holiday. Nothing that strained the brain – that’s for sure!! “Cream Puff Murder” by Joanne Fluke. I’ve read a few of these – they were the first thing that our town librarian recommended for light entertaining reading. And she was right. It’s not the sort of thing I would have been seen reading a few years ago, but I guess there comes a time in life when reading ‘fluff’ is kind of OK!!!! The plot is pretty much the same in all of the books – Hannah Swensen, girl cookie chef encounters a dead body as she is going about her daily business. By various ways and means with the help of her lovely friends and family she solves the completely improbable murder, never quite decides whether she wants to marry the cop or the dentist (I vote for the dentist because he loves her best, even though he’s not a heart throb like the cop), runs her cookie business and keeps her large ginger cat well fed. The only thing that gets me is; how can all the people can be so darn nice – in a small town where someone gets murdered every other week!!! I’d be moving out if it were me!!! “Entertaining Angels” by Judy Duarte. Kind of vaguely Christian – inspirational. Again easy reading and light-hearted. Even though some of the characters had major problems going on in their lives, you knew that it was just going to turn out ok in the end because it was that kind of book. I enjoyed reading it, even though it was kind of predictable. The right sort of easy read book that’s good for a summer holiday and on the other hand if you did want to apply a bit of thought to it, there were quite good messages about persistence and hope and giving people a second (or third or fourth) chance. “The Stallion” by Joyce Stranger. Anyway, I remembered these books as having amazing descriptions of nature & animals, and for being very intense and almost dark in the feelings that the characters had. The book was just as good in that regard as I remembered – even though it did seem a little old-fashioned – and I thoroughly enjoyed my little jaunt into the past. Well, this was the only one of the books I took with me that I didn’t finish, and in fact, I returned it to the library unfinished. Trying to put 100 places in one book means that only a paragraph or two can be written about each one, and it just wasn’t enough information – or sometimes it was too much. It was an interesting concept and what I did read certainly had a female, even feminist perspective, but with so many places mentioned it got to be brain overload after a while. Also – it was kind of organised by ‘topics’ where as for me I think to have it arranged by countries would have been more helpful. So that was the only book that would not score well for me out of the four. Who knows when I’ll next get to read most of four books in a week. 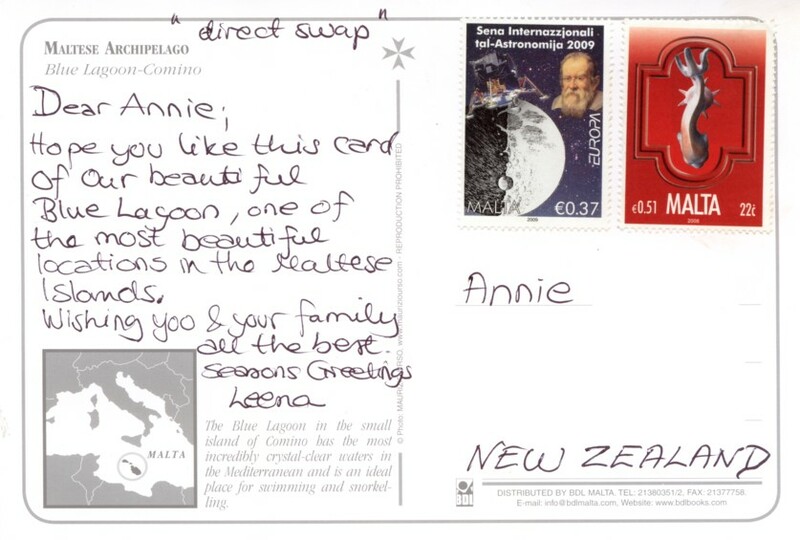 Today’s postcard is a private swap with Leena who joined up with Postcrossing almost the same day as I did, and contacted me to do a swap. This amazing blue is the ‘Blue Lagoon’ of Malta. The water between the small Maltese island of Comino and an even smaller island – or large rock – called Cominotto, is so clear that it is an excellent spot for snorkeling. 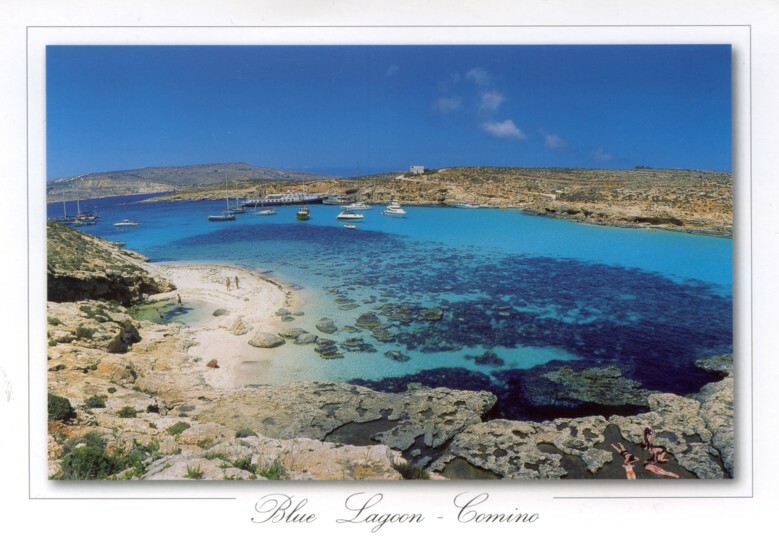 Comino has – apparently – a permanent population zero, three, four or eight people (depending what you read), but is a very popular tourist location with one 4 star hotel, so it seems that there is usually more than four people there! Comino is also a nature reserve and bird sanctuary today. The Mediterranean climate on Comino has temperatures ranging between 30 degrees Celcius in summer and down to 15 decgrees Celcuis in winter. There is very little rain so nothing much grows there apart from wild thyme and a few other small plants. The most prominent building on Comino is Santa Marija or St Mary’s Tower (the white building in the middle of this picture.) It was originally built in the 1600’s as a watch tower in case of invasion, and was used again for this purpose during WWI and WWII It has also probably been used as an isolation hospital, an outpost to send misbehaving knights to, and a farm building. It appears to the property of the Maltese Armed forces, but is being restored by the National Trust of Malta and one of the purposes it is used for is a watchhouse to guard against illegal hunting of the birds on Comino. The most odd thing, is that never having heard or read much about Malta before, I’d picked up a novel at the library a few weeks ago but hadn’t started reading it until last week – to find that it was set in Malta!!! The book is ‘The Brass Dolphin’ by Joanna Trollope writing as Caroline Harvey. It’s an ok book – probably if it wasn’t set in Malta, and I wasn’t reading it at the moment, I probably would not enjoy it as much as some of the other Joanna Trollope books that I have read though. We went to the city this weekend. PB a conference to go to, so while he sat in a boring lecture room in the bowels of the hospital, on Saturday morning I enjoyed the sunshine outside in the Botanic Gardens for a bit. I did find a geocache but mostly I watched people. Pose. Smile. Click. Pose. The Asian tourists. They seemed to be mostly in groups of parents and adult children – as far as I could tell – and by the time every possible combination of people in the group has been photographed in front of every tree, flower, and feature, that makes for an awful lot of photos, or a lot of awful photos…… but truly, they were the only ones taking photos. Well, except me. I kept wanting to tell them this isn’t really New Zealand, that a tulip here looks the same as a tulip anywhere. The American tourists were riding around the Gardens in the ‘caterpillar’ – which looked strangely like a slightly oversized golf cart with little wagons pulled behind it – getting the guided tour. They were middle-aged couples on the whole. I guess there were some British folk in there too, but you wouldn’t hear them amongst the Americans. Listening to the driver/guide repeat the facts and tales that he’s recited probably a few hundred times by now. They probably wouldn’t know if he lost his place in his talk and was referring to completely the wrong tree. Maybe he wouldn’t notice either. As for the European tourists, well, they were walking. Fast. With guide books or maps literally in hand. They didn’t really stop in the Botanic gardens. They were going places. The Museum perhaps. Or the Arts Centre. Maybe the Art gallery. Young couples, talking rapidly. I hope they stopped long enough to have some fun. The locals were moving slowly, languidly, drifting about in the unexpected early summer sun. Groups of friends lazing, gossiping on the grass. One or two individuals with a book, or a coffee in hand settled on a park bench. Or families hand in hand strolling down the paths, feeding the ducks, climbing on the statues, all in no great hurry to get anywhere. After all, it’s Saturday morning and the whole weekend is ahead of us. Except, in juxtaposition, we are disturbed and interrupted from our slowness by the joggers. Racing past, checking wrists, iPods on arms, wired for sound and pulse and who-knows-what else. Panting and sweating and spoiling the slow motion of the day. But I expect they find us wanderers and strollers annoying, in their way, slowing them down from where-ever it is they have to get. My book, with its different perspective on the world, seems to make more sense here outside, watching the world. Dogboy by Eva Hornung – about cruelty and kindness, hope and pain, love and abandonment, how the world isn’t always how we see it. Anyway, here’s a photo from the Botanic Gardens.